This listed home on one of central London’s grandest squares was beset with planning restrictions. After much dialogue it was eventually agreed that a ‘secret winter garden’ was allowable. This meant a rooftop conservatory so sleek that very little is visible from the street. The glass is lightly tinted, which cuts down glare and helps the glass blend in with the surrounding slates. All framework is fully glazed from outside, resulting in a flush finish and no unsightly external framing. 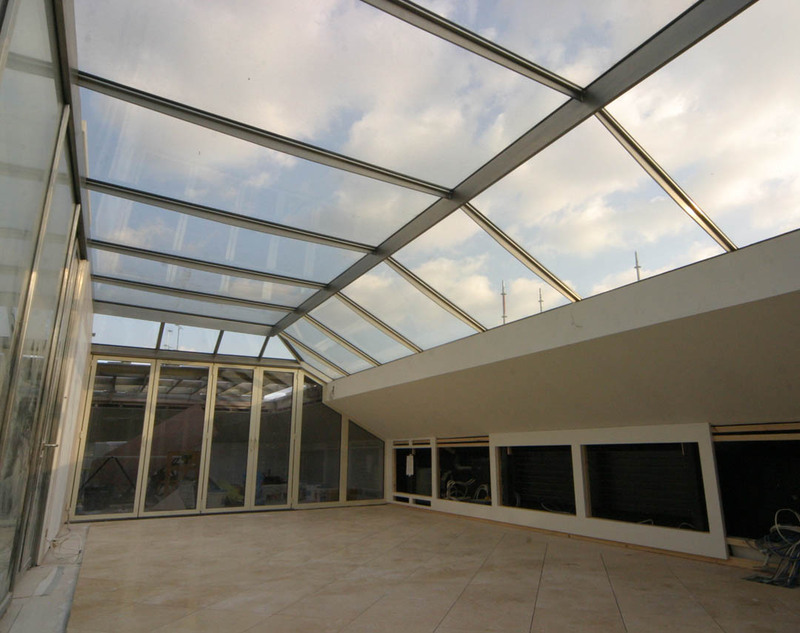 The potential for an opening roof was eventually stopped by planning consents, so this slim framed static installation was the final solution. There is no ‘structure’ per se, as all the frame elements work in a monocoque fashion, each member sharing the forces. Blade framing was used for the larger steel, with tapered ‘T’ mullions in-between. The vertical glazed wall to the adjoining staircase is all fire rated, and designed to match the winter garden framing above. As with virtually all our work, the metal is stainless steel with a brush polished finish for the neatest finish whilst also ensuring warranty guarantees are valid. In order to keep the ‘visual bulk’ of the 6200kg assembly to a minimum, there are very few flashings. However, this does mean the frame and glass structure itself is the final finish and needs very careful machining and fabrication. All perimeter flashings have to be particularly subtle as they are a direct connection between ‘contemporary modern’ and ‘listed history’.